The pattern of sabino horses is polygenic - that is, controlled by more than one gene. 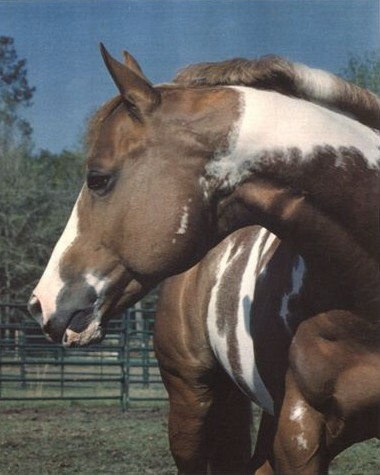 Two major genes have been hypothesized to work together to account for the occurrence of both normal white markings and the markings of sabino horses (Gower, 1999). One should remember that although the scheme proposed by Jeanette Gower is perfectly plausible it may turn out to be a simplified version of reality. In addition it is well recognised that several minor genes act together to affect the amount and placement of white in any particular horse, not just sabino horses. This character is also proven to be partly determined by environmental factors during a foals development before birth. The presence of any white (not just in sabino horses) is hypothesised to be recessive (NnNn), with the wild-type allele for no white being dominant (N+). The gene is also thought to show dominant epistasis over the alleles at the sabino gene. Thus any horse with the N+ allele is thought to be solid colored, without any white markings at all, regardless of its genotype at the sabino locus. Sabino itself is thought to be due to a dominant allele (SbS), with the wild-type (Sb+) allele being recessive. The table summarises the possible phenotypes due to the genotypes at these two loci. Gower, Jeanette. 2000. Horse Colour Explained. A breeders perspective. The Crowood Press. ISBN 1 86126 384 8. Back to main page on sabino horses.